President of the Public Service Association (PSA) Watson Duke should lead by example. This was the strong opinion of branch president of the Bank Insurance and General Workers (BIGWU) Kester Duncan who was against Duke’s suggestion that the employer, the Government, put $15,000 in each public officer’s account by the end of this month. 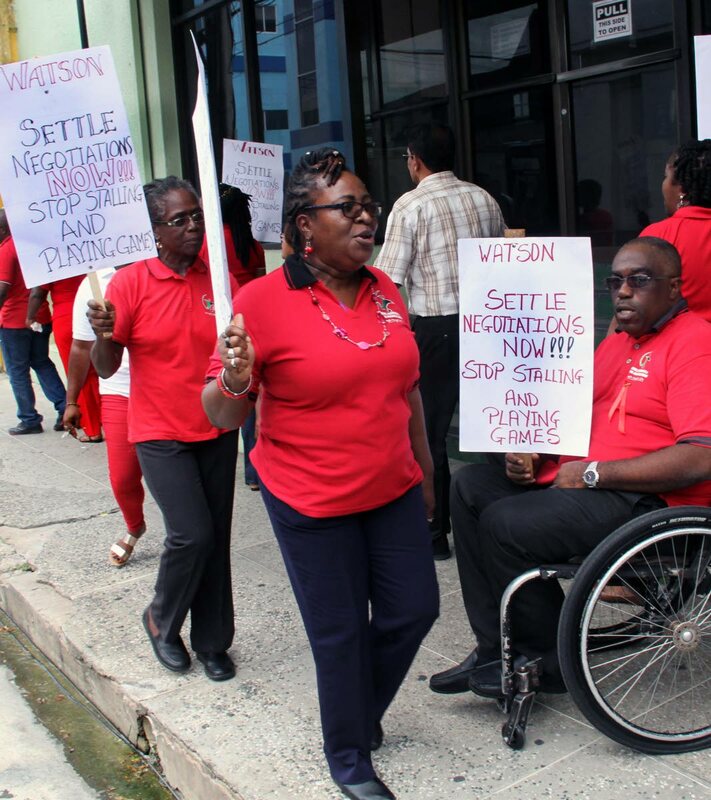 Several BIGWU members held a protest yesterday outside the PSA head office on Abercromby Street, Port of Spain, showing their discontent for Duke’s decision. “We have our negotiations outstanding. He wants the payment for 2014-2018, but our negotiation staff year is outstanding since 2010 and we are on the same salary. Duke, for his employer to be able to treat with him in that particular manner, charity begins at home. He has to remember that he has workers here and we are the ones doing the work here and we are supposed to be treated as such,” Duncan said. He said if Duke could meet and treat with them through their representative union, then the Government, who was his employer by extension, would be able to relate to him diffferently, but he as their employer needed to start to show the example first. “Our negotiations are outstanding since May 2009. We are now in 2018 and he has done nothing to meet with our union to start the negotiations around the table. He is saying that they need to meet and start to talk, but he is doing nothing to that effect and we, the staff, are saying you have to lead by example. “For the employer to take you seriously, step up to the stage and start to negotiate with the staff on behalf of the union representing them and they could deal with you differently, but you are not doing that. You are making demands yet your staff here are under these adverse conditions. He needs to start to show by example,” Duncan said. “Every time the PSA opens its mouth and speaks about salary increases they are against. They are interfering with our members while they are coming in to meetings. Stop the politicking on the job, deal with the issues, do not campaign for our members. Do something with your lives, write a book, a thesis,” Duke said. On allegations that the doors to the union office was locked when workers showed up, Duke said the place was opened the next day. He said the BIGWU members cried discrimination. Duke said the average worker within the PSA earned more than the average public servant. Reply to "Duke told to lead by example"